Citation: Van den Bijgaart RJE, Lin C, Kong N, et al. Live Microscopy of Primary Tumors and Lung Metastasis in Mouse Models of Breast Cancer. Arch Cancer Res. 2016, 4:2. Live imaging opens up the possibility to visualize the dynamic molecular and cellular events underlining different stages of tumor evolution over long periods of time. The MMTVPyMT mouse model demonstrates a progressive disease that parallels the stages of human luminal B breast cancer subtype, exhibiting dissemination of cancer cells to the periphery . Intravital imaging on the MMTV-PyMT mouse model can provide insights on tumor processes. Since these are mammary tumors, minimally invasive skin flap surgery allows optical access to the breast tumor, followed by confocal imaging. When the skin flap is removed, a glass microscope slide is attached to the skin behind the mammary gland. An oximeter is used to monitor breathing and pulse . The breast tumor could then be monitored over several hours and tumor processes such as cancer cell motility, interactions between cancer cells and stromal cells in the tumor microenvironment, and cancer cell intravasation can be observed . This imaging modality could also facilitate studies examining response to therapy . Intravital microscopy enables visualization of highly dynamic processes while sectioning shows static images. This method is relatively non-invasive, as it does not affect the peritoneal cavity, or any major blood vessels. Additionally, it is commonly well tolerated by mice accompanied by easy monitoring measures. Crossing the breast cancer mouse model (MMTV-PyMT) into a transgenic reporter mouse (ACTB-ECFP) enables visualization of the primary breast cancer niche (upper part), showing the tumor in blue. Subsequent injection of high molecular weight Dextran labeled with Fluorescein in green before imaging allows observation of blood vessels. Intravital imaging of tumors over several days and weeks can be achieved by imaging windows . The cartoon shows the various stromal components within the tumor microenvironment involved in tumorigenesis and could be studied by intravital microscopy . Cancer metastasis greatly increases mortality rates. The lung is a prevalent site for breast cancer metastases. The anatomical localization and function of the lungs complicates intravital imaging, as opening of the chest cavity leads to loss of negative pressure resulting in collapsed lungs . The alternative ex vivo lung section imaging provides stability and depth, but the sectioning process is lengthy and leads to extensive cell death that can interfere with the quality of imaging . Ex vivo lung imaging of whole lung lobes provides a reliable method to perform fast and easy imaging of the lung metastatic niche . 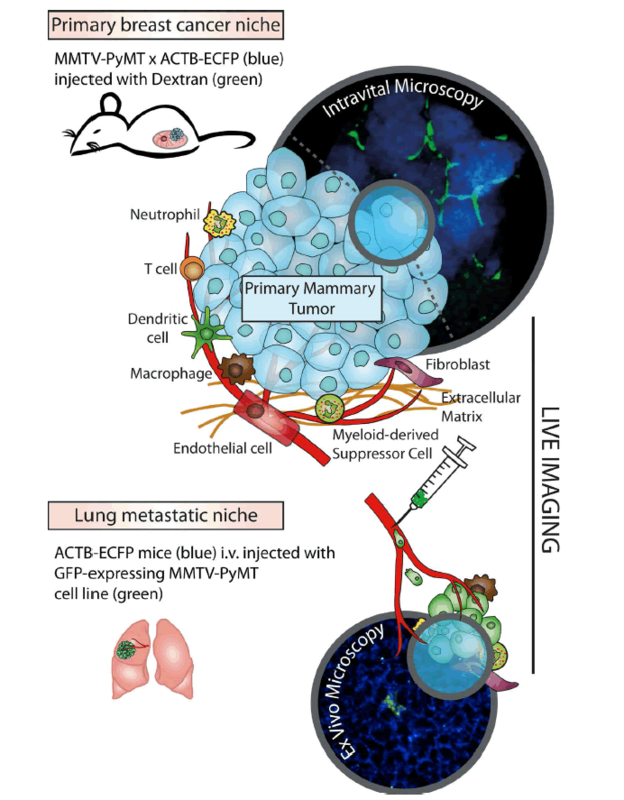 To visualize metastatic cells in the lung microenvironment (lower part), a green fluorescent protein (GFP)-expressing MMTV-PyMT cell line can be injected into fluorescent reporter mice (ACTB-ECFP) that highlight the lung parenchyma in blue. As with the primary tumor, the cartoon shows the various cells within the metastatic microenvironment that could be studied using this method . 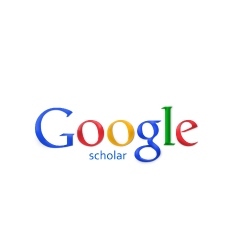 This work was supported by a Department of Defense Postdoctoral Fellowship (W81XWH-11-01-0139) to V.P. Nakasone ES, Askautrud HA, Kees T, Park JH, Plaks V, et al. (2012). Imaging tumor-stroma interactions during chemotherapy reveals contributions of the microenvironment to resistance. Cancer cell 21: 488-503. Kedrin D, Gligorijevic B, Wyckoff J, Verkhusha VV, Condeelis J, et al. (2008). Intravital imaging of metastatic behavior through a mammary imaging window. Nature methods 5: 1019. Looney MR, Thornton EE, Sen D, Lamm WJ, Glenny RW, et al. (2011). Stabilized imaging of immune surveillance in the mouse lung. Nat Methods 8: 91-96. Thornton EE, Krummel MF, Looney MR (2012) Live imaging of the lung. CurrProtocCytom 12: 28.
van den Bijgaart RJ, Kong N, Maynard C, Plaks V (2016) Ex vivo live imaging of lung metastasis and their microenvironment. J Vis Exp..